Today is World Water Day, a day that is held annually on the 22nd of March to focus attention on critical issues linked to the water sector. Every year a different work area of the UN is put in focus and this year, the UN and the FAO are highlighting the critical link between water and food. Not only do water and food both face scarcity, but when both are combined, the risk of corruption is high. 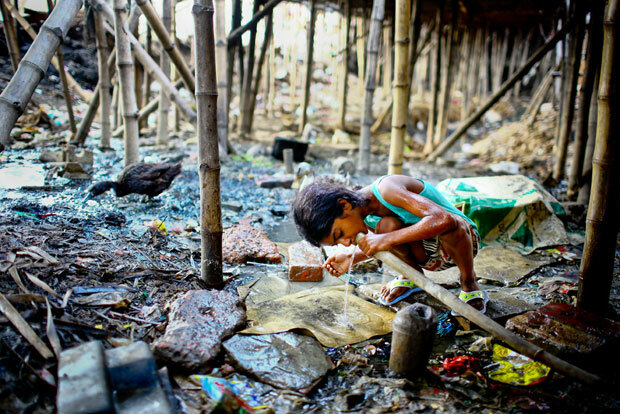 In Mirpur slum, slum dwellers have to wait hours and hours in the queue for water. Children drink water whenever they get the chance to get a pipe. Slum dwellers of Mirpur hardly get drinkable water. Bad smell and impure wastage make the water high-risk. Dhaka, Bangladesh. Winner of the second WIN photo competition in 2011. My colleagues from the Water Integrity Network and I just returned from a very busy week at the 6th World Water Forum which took place in Marseille from the 12th until the 17th of March. There, WIN worked with the UNDP Water Governance Facility (WGF) at SIWI and Transparency International (TI) to put good governance, and more specifically issues of transparency and integrity on the agenda. Two targets related to the topic of good governance were subsequently developed aiming at achieving wider use of corruption risk assessments and diagnostic studies and promoting clear mechanisms for transparent information sharing, including budget transparency. The initiatives taking place at the grassroots level need to be complemented and directed by adequate policies. A Policy Brief was therefore produced to share key recommendations for water integrity with policy-makers worldwide. Governance is crucial in achieving efficient, sustainable and fair water distribution and delivering adequate sanitation services. However, there is no blueprint formula for good governance in the water sector. The complexity of institutional and governmental structures calls for a diverse approach to good governance creation. 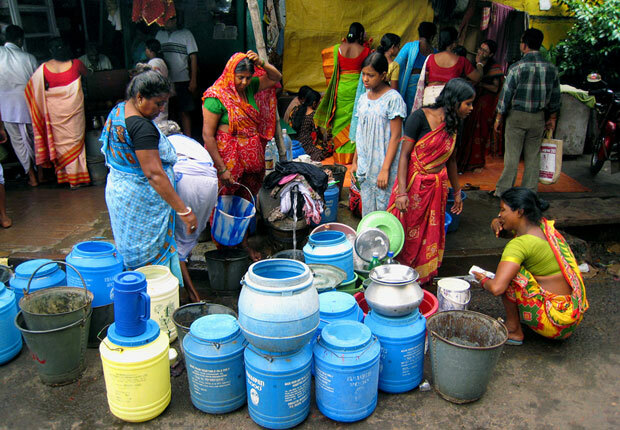 Queue for life - Slum dwellers, in Kolkata city of India who don’t have access to a separate supply, are queueing to collect water for daily use from the roadside tap arranged by the local municipality. A main session was organised on the morning of March 15th. It was a lively session with a diverse and interesting selection of case studies from Africa, Europe and Asia, which inspired as well as incited water stakeholders to take action to improve integrity and transparency, with a view to reduce corruption, in the water sector. The presenters shed light on what can be done to reach our targets. One of the presenters, Babatope Babalobi from the West Africa WASH Journalists Network reminded the audience of the critical role of journalists as watchdogs for accountable behaviour in the WASH sector. Despite the highly sensitive issue and the dangerous working environment, Babatope and his network continue to improve the quality and accessibility of public information in the sector. The role of the media in highlighting issues of integrity in the water sector is also acknowledged today, on World Water Day, as WIN launches its third photo competition. Photography is a great way to raise awareness on crucial issues that affect everyone. It allows for an approachable manner to approach and understand the often complex topic. This year’s photo competitionseeks to explore the relationship between water and food, with a specific focus on integrity or corruption risks. 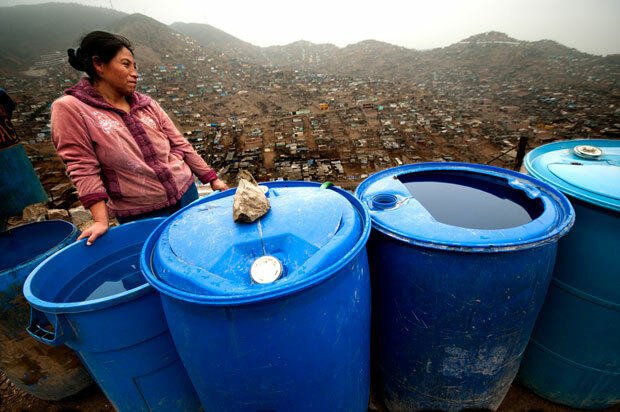 A woman in Pamplona Alta, Lima - Peru, next to the big blue drums they use to fill with potable water that trucks deliver to them every two days. This water is at least four times more expensive than water other people usually have at home. See more photos from our 2011 photo competition here.